In a very small nutshell, the process known as electrical discharge machining was observed by the English scientist, Joseph Priestley in 1770. 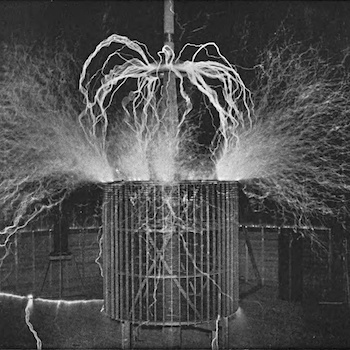 It took 143 years before two Russian scientists “accidentally” stumbled upon a somewhat useful application for the process. At the same time, 1943, three Americans were working on a way to remove broken taps and drills from aluminum castings. One thing led to the other and eventually the EDM machine developed into a slow but useful machine tool. When I came on the scene as a mold maker apprentice in 1978 the manual EDM was in daily use. I had recently completed a two year program at a local technical college and was keen on EDM and had to this point only make EDM electrodes. Our shop had a ram-type machine also known as a sinker EDM. The Eltee-Pulsitron company in New Jersey seemed to have captured the market where I lived and millions of mold components were burned on these precise but mysterious machines. The wire EDM, or WEDM was also developed around the same time as the sinker but seemed to only have applications in the progressive die industry. I remember sawing and filing die openings before the WEDM; what a pain! This was extremely time-consuming and took great skill to do by hand. When the WEDM came to town everything changed in the die making industry. Today’s advanced circuitry, flushing, electrode materials, and CNC controlled machine movements are a marvel to behold, especially compared to the machines of only 30 years ago. Speed, precision, surface finish, steel integrity and cost have all improved dramatically. Long ago, in the far distant past of 20 years ago, EDM operators had all kinds of homemade tooling to mount graphite or copper in order to machine it and subsequently use in the EDM. This actually worked well, but required a skilled and dedicated operator, plus it was time consuming. Soon companies such as Charmilles and Agie, of Switzerland, began supplying automatic programmable tool changers, which meant that the machine could operate unattended for hours, even overnight. Occasionally of the grippers might break during use, nevertheless these were dependable advances toward automation. Then somebody got the brilliant idea of building a robotic tool changer that could not only change electrodes, but the workpiece as well. The next step was to use the same robot to move the electrode and workpiece to the coordinate measuring machine for inspection and verification. Not to be satisfied, the robot could even move the electrode to the graphite milling machine for processing, to the CMM for inspection and finally to the EDM where it would wait in line to edm the workpiece. This development has occurred due to increased demand for short lead times and the absence of skilled operators/toolmakers. In concept this all works quite well, in practice it is very difficult to accomplish. One problem companies face is the willingness to fully invest in and embrace the technology. Consequently there are many shops running a sort of hybrid factory automation system for EDM. Without quality EDM tooling the entire machining process slows to a crawl. Sure, a good toolmaker can make some kind of V-block or step-block that repeats consistently , both in a milling or grinding operation and in the electrical discharge machine. But if the job calls for dozens of unique electrodes it simply takes too much time and skill. Thankfully the Swedes and Swiss have developed high-end EDM tooling that is simple, consistent, repeatable, and durable. Of course, this type of tooling is also expensive. Nevertheless, over time it will pay for itself again and again. There are always special cases where homemade tooling works as good as or better than the high end brands, but, in general, quality tooling is the way to go. Both the sinker EDM or WEDM require quality supplies if the desired results are going to be attained. Skimping on EDM supplies is simply not a good idea. Some things, such as copper and graphite can be reused again and again, though it is rather labor intensive to do so. WEDM wire can be recycled, but obviously not reused. Small hole EDM tubing can also be used repeatedly, saving money on supplies. EDM graphite. Numerous companies manufacture quality graphite for roughing and finish settings. Graphite is a strange material that can be easily machined by milling, grinding and WEDMing to very close tolerances and is superbly engineered for high performance EDMing. EDM copper. Before the development of graphite machining centers with vacuum suction built in, copper was the material of choice in Asia and Europe. This clean running machining centers, plus the fact that EDM manufacturers began making circuitry that enabled graphite to burn details quickly and accurately enabled graphite to become the material of choice. Copper is still widely used in many applications, often for fine finish or special details. Copper impregnated graphite, copper tungsten, pure tungsten, tungsten carbide, tellurium copper and silver tungsten are other materials used less often in EDM, mainly for extremely fine details or exotic metal EDMing. Dielectric fluid. 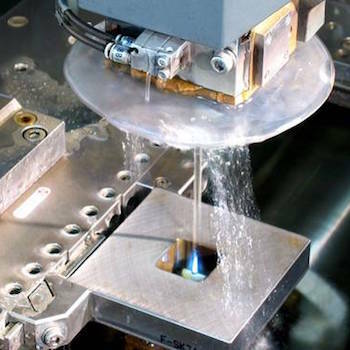 Ever since the Russian scientists noticed that their electrodes had less wear when submerged in fluid companies have improved the dielectric fluids use in electrical discharge machining. When I began mold making in 1978 the entire shop smelled like the kerosene based fluid used in the Eltee-Pulsitron machines. Now you can even find bio-degradable oils that work well and don’t emit that kerosene odor. Filters. The dielectric fluids must be filtered to maintain a clean working environment for the process. Dirty fluids influence the burning parameters and change the results, usually for the worse. WEDM wire. Like a bandsaw, the stretched wire passes through the metal workpiece, cutting the desired shape. The most common wire is brass, but there is also brass zinc coated, pure tungsten and specialty wires. Ceramic wire guides. These little guides naturally wear out over time and must be replaced to insure accuracy. De-ionizing resin. This resin is added to the water in order to remove charged molecules (ions) to facilitate the cutting process. Once the water is filtered in the machine it is measured for resistivity and automatically adjusted by the resin to predetermined levels. In most shops the EDM department is run by specialists who typically operate several machines simultaneously. EDMing is a difficult job and requires tremendous attention to detail and procedure. Everything about it is measurable, predictable and often frustrating. Sinker and wire EDM are obviously similar, yet distinctly different. A skilled EDM machinist/operator is always in demand and should have little trouble finding a good job. Globally, EDM is a growing machining process with no sign of decreasing. New applications are frequently found in aerospace, medical, mold making, tool-and-die making, precision machining, and mass production. 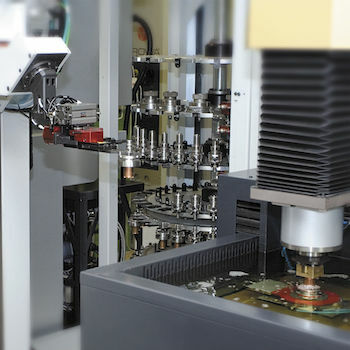 Advances in the EDM machine tools are increasing cutting speeds, obtaining finer surface finishes and reducing operating costs. This should open doors for more applications and opportunities.